Many of you may be familiar with The Meal Makover Moms. On their website, MealMakeoverMoms.com, the duo of Liz Weiss and Janice Newell Bissex focus on nutrition for the family and inspire readers to get healthy meals on the table. Their cookbook, No Whine with Dinner, focuses on healthy, kid-friendly and kid-tested recipes. This cookbook is filled with recipes that are designed with picky kids in mind. I found so many recipes that I think my children will love: Blueberry Cornmeal Pancakes, Nest Eggs, Buffalo Chicken Pizza Pies, Banana Zucchini Squiggle Loaf, and Apple Butterscotch Squares. On my last shopping trip, I bought several cans of black beans so that I can try Lime & Honey Black Bean Dip and Fudgy Black Bean Brownies. With this cookbook, the authors show how nutritious meals can be incorporated into the entire day with chapters such as Morning Makeovers, Lunch Box Winners, Slow Cooker Creations, Crazy about Casseroles, Snack Attack, and Dreamy Desserts. There are also chapters that feature recipes from other bloggers and secrets for getting picky eaters to try new foods. One of the secrets in the cookbook that I find helpful in my own home is to have a theme night. My kids always respond to Mexican Monday or Whatever-We-Want Wednesday. If you're wanting to add more nutritional recipes to your family's routine, this is the perfect cookbook to help and inspire you to reach that goal. These recipes cut excess fats and add more whole grains to common recipes. The recipes are simple to prepare and are perfect for the home cook. I tested two recipes from this cookbook, South-of-the-Border Tortilla Soup and Roasted Cauliflower with Crispy Leek Rings. Both were delicious. I added some chicken to the tortilla soup so that my husband would consider it a meal. A rotisserie chicken makes this soup the perfect fall meal. I love roasting vegetables in the oven. 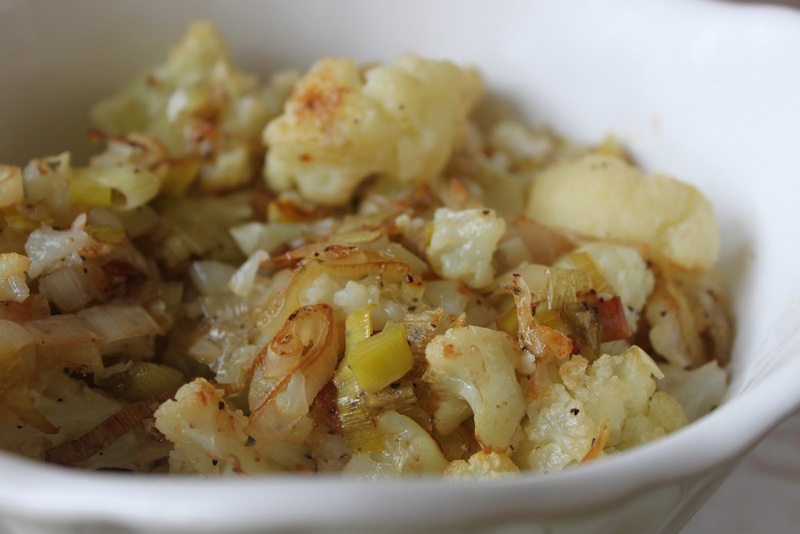 Roasting brings out the vegetables natural sugars and it also takes away the pungent flavors of vegetables such as cauliflower and broccoli. Heat 1 tbsp. of the oil in a large Dutch oven or saucepan over medium heat. Add the onion and cook, stirring frequently, until softened, about 7 minutes. Add the garlic, cumin, and chili powder and cook for an additional 1 minute. Stir in the broth, tomato sauce, black beans, and corn. Cover, raise the heat, and bring to a boil. Reduce the heat and simmer, uncovered, until the flavors meld, about 10 minutes. While the soup is simmering, heat the oven to 400 degrees F. Pplace the corn tortilla strips in a large bowl and toss with the remaining 1 tablespoon oil until well coated. Place on a rimmed baking sheet and cook until golden and crispy, stirring halfway through to ensure even cooking, 10 to 15 minutes. Whisk together the cornstarch and water in a small bowl (this is called a slurry). Bring the soup back up to a boil, stir in the slurry, and cook, stirring constantly, until the mixture thickens slightly, about 3 minutes. 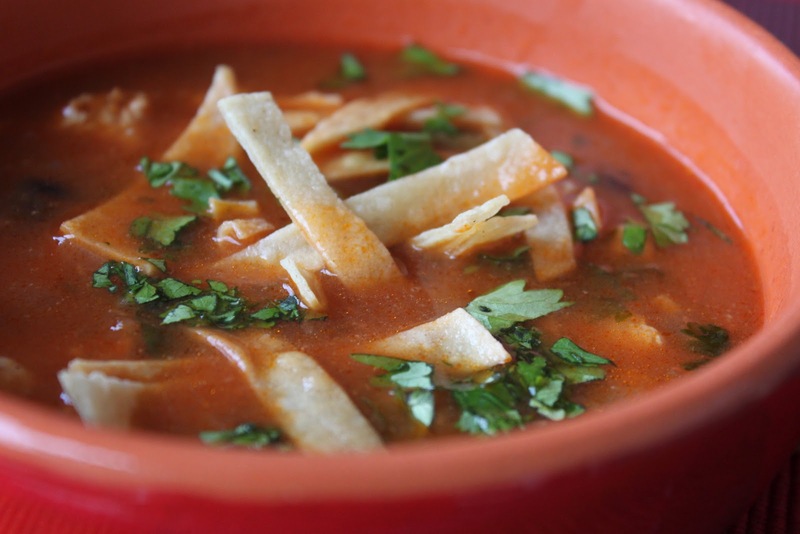 Top each serving with tortilla strips and the optional toppings as desired. If you would like to buy your own copy of No Whine with Dinner, check out The Cookbook Marketplace. 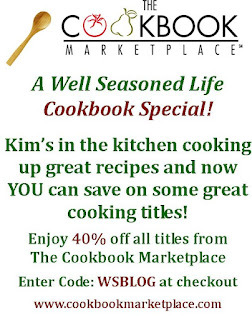 By using the link provided below along with the special code WSBLOG, you can receive 40% off of all titles at The Cookbook Marketplace. I have seen other features on this title & the book appears to be a great value, well thought & timely.